Silence is 12-year-old Michael’s way of coping with the troubles in his life. Living with a mentally disturbed mother, Michael has to cope on a day-to-day basis with alternating outbursts of affection and disdain. In order to appease his unstable mother and help her preserve her fragile sanity, the boy often gives in to her different whims. At night Michael often spends his time alone in the woods near his home, far from his mother. It is in these woods where Michael one night finds the body of a missing woman. This unsettling encounter undermines the fragile foundations upon which the silent and troubled boy has built his life. A tale of violence, Chain is an exploration into human nature’s aggressive side; set in latter-day Israel, it is a parable which reflects on the fate of a culture where aggression and bloodshed have become a part of everyday life. Inspired by a short story by Tobias Wolff. Official Selection: Tirana International Film Festival, Brooklyn International Film Festival, and the International Festival of Short Films on Culture (Jaipur, India). 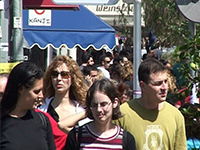 Shot during one sunny afternoon in Tel Aviv – on an ordinary street, in an ordinary café, with ordinary people – it is a tale of a possibility that all too often becomes a reality. Based on a poem by Wislawa Szymborska, Watching is a film which bespeaks of a connection between different cultures through the specific, horrible predicament of one. Official selection: Zebra Poetry Film Award (Berlin), Interfilm Berlin, ARTFilm Slovakia, Izmir International Poetry Festival, and Invideo Milan.